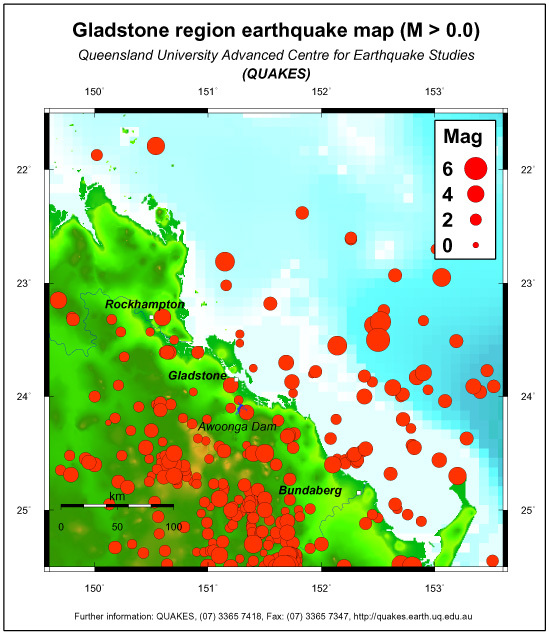 The Queensland catalog contains a total of 409 earthquakes in the Gladstone map region. Shown here are Richter magnitude ML > 0 events. Gladstone lies on the northern edge of what appears to be a high seismicity belt stretching from Brisbane to Gladstone. Arguably the largest earthquake to strike in or adjacent to eastern Australia struck about 135 km offshore Gladstone in 1918 (Richter magnitude estimate of ML=6.3 based on felt area and ML=6.0 based on an instrumental recording). Although the epicentre of the earthquake was offshore, it was felt from Mackay in the north to Grafton, NSW in the south, to Charleville in the west. Damage in the form of fallen chimneys, cracks in walls and broken windows was reported in the Rockhampton region. Some damage also reported in the Bundaberg area and minor damage occurred in Gladstone (Modified Mercalli Intensity of VI). Note that Modified Mercalli Intensities of VII and VIII which are capable of causing serious damage were noted on Quaternary floodplain alluvium in the Rockhampton area. Other noteworthy earthquakes near Gladstone include the 1953 Many Peaks earthquake, the Heron Island 1978 earthquake, and the 1998 offshore Rockhampton earthquake. The Many Peaks earthquake located nearby Many Peaks caused minor damage (Modified Mercalli Intensity V) in Many Peaks and nearby townships. It was widely felt in Gladstone (Modified Mercalli Intensity IV). The 1978 Heron Island earthquake was located to the east of Heron Island and was widely felt in Gladstone (Modified Mercalli Intensity IV) and along the coast from Rockhampton to Maryborough. The offshore Rockhampton 1998 earthquake was strongly felt on Heron Island with one person reportedly being thrown out of bed. During the event in Yepoon, the beach suburb off Rockhampton, one resident described his house swaying and creaking on its stilts, windows rattling and water sloshing in the toilet. Other earthquakes felt in Gladstone include the 1883 ML=5.9 Gayndah earthquake, the 1910 ML=5.2 Mundubbera earthquake, and the 1935 ML=6.1 Gayndah earthquake. Only one seismograph is located near Gladstone at Awoonga dam.